Oral surgery is an umbrella term for surgical treatments such as gum or periodontal surgery, dental implants, general or wisdom teeth extractions and bone grafting. Dental implants, an excellent solution for missing teeth, are surgically placed titanium material that replace roots of missing teeth and hold dental crowns in place. A wisdom tooth extraction may be recommended if there isn't enough room in your mouth to accommodate wisdom teeth and they become impacted, partially erupted or infected. Tooth loss from periodontal disease or other dental conditions may cause the jaw bone to weaken, and the resulting bone loss will lessen the possibility of the patient being able to support a dental implant or other dental appliance. 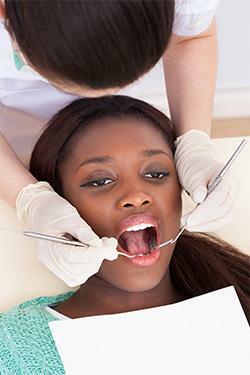 In such a case, a procedure called bone grafting is often used to add bone to the jaw. Once the grafted bone fuses to the jaw bone, a dental implant can be placed, with greater chances for success. Bone grafting is also used to improve bone deterioration caused by dentures, oral cancer, dental deformities or a tooth extraction. During the bone grafting procedure, we use synthetic bone called Synthograft to augment bone deficiency where we plan to add an implant, treat gum or periodontal bone defects and to support other options for teeth replacement. Dental implants are an extraordinary blend of science and art. Made of titanium, dental implants are securely anchored into the jaw and serve as roots for dental crowns. In many cases, dental implants – and mini dental implants, the smaller version -- are considered the best option for replacing missing teeth. Dental implants are changing the way people live! With them, people are rediscovering the comfort and confidence to eat, speak, laugh and enjoy life. Whether you need one tooth, multiple teeth or all of your teeth replaced with implants, or if you are looking to improve the retention and stability of your existing dentures, our formal specialty training and expertise means all of your implant options can be thoroughly explained and offered within our office. 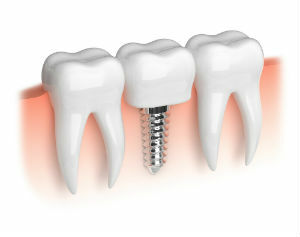 Some of the types of implants we use are The Bicon and The Hahn Implant systems. If, like many others, you feel implant dentistry is the choice for you, we ask that you undergo a dental/radiographic examination and health history. During these consultation visits, your specific needs and considerations will be addressed and we fully understand the emotional and financial investment people undertake with their dental treatment and that is why we are committed to making sure you are well versed in both your treatment options as well as what to expect during the course of your treatment and beyond. Your questions and concerns are important to us and our team will work with you very closely to help make your procedure a success.